A few weekends ago, I was invited to a food review at Bali Hai Seafood, for their Ramadhan Fare. If you're not sure where Bali Hai is, it is actually located at the exact same spot of the old Asia Cafe in Kota Damansara, just next to Tune Hotel. There are plenty of parking lots in this restaurant but RM1 will be charged after 6.30pm. daily. 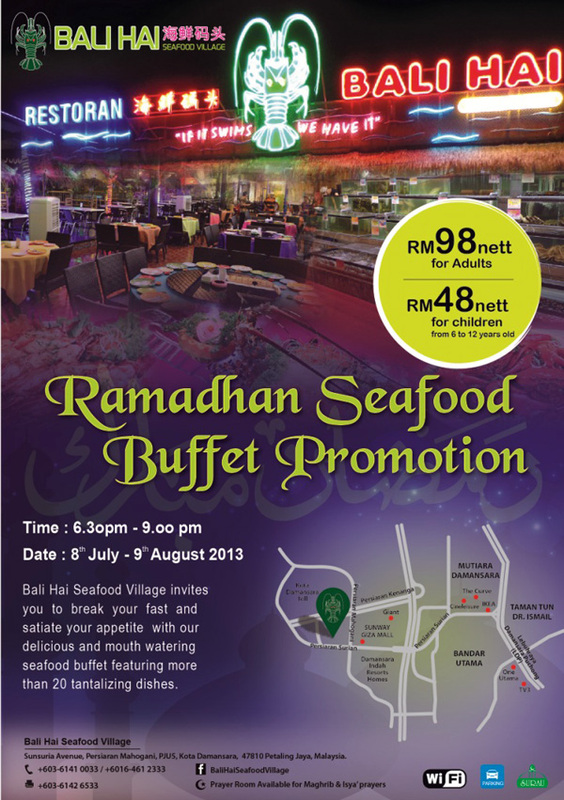 The Bali Hai Ramadan Seafood Buffet starts at 6.30pm until 9.00pm everyday until the 9th of August 2013. 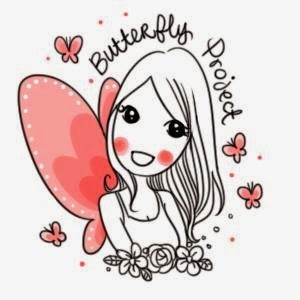 As there is an assortment of seafood on the menu, it is a rotating menu and each day the cooking styles will differ so it's better to give them a call to find out more about the menu rotation. What I love about this place is how they maintain the freshness of their seafood. Besides having live fish and crabs, etc, they will also 'bury' their fish in the ice to keep it cool and it's fresher than most others you will find outside, whereby they will just leave it on the ice. Another thing about them that I like is the size and freshness of their Oysters. You might think that they will not be fresh, but I kid you not, even though they are HUGE in size, they really do pack a big punch! Unlike most restaurants in town, Bali Hai offers a very very wide variety of seafood for their patrons. On top of the Ramadhan buffet they are offering, if you want something more from what's on the table, you can also choose from the ala carte menu of the array of seafood available. The seating capacity is about 700 pax, inclusive of 5 private dining rooms, and 8 gazebo huts. Chilled vegetables on display, which you can also choose to add on from the ala carte menu on top of the buffet spread. Moving on to the array of seafood and dishes available at the buffet, I present to you, first, from the bbq table. There is an assortment of mushrooms, which are oyster muushrooms and brown button mushrooms. There is also long beans, and all these vegetables are seasoned with a special type of sauce (which I have ever only tried in Kuching, and I love it)!! The brown button mushrooms are good too :) I had to stop myself from eating more than what I usually do, at the expense of feeling a little uneasy from consuming too much. I read somewhere that having too many mushrooms will make you sick, but I can't for the life of me remember where I read it from. On top of the grilled mushrooms, the next item is Roasted Chicken Wings! Gave me a taste of the chicken I love back in Kuching. While some may say it's too salty, I like it that way :D hahaha maybe I have a weird palate. Satays galore :D delectable and soft. Behold, the buffet spread. Apart from the normal fried rice, vegetables and chicken, what makes this buffet special is their array of seafood dishes. Superior Soya Sauce Prawn. When I took a bite of the prawn, I was transported to Prawn Heaven :p I went back for three helpings :p The prawns are really fresh, and do not have the sandy aftertaste. Cos it's so fresh, the meat is chewy and succulent, and it is not too dry to make it hard to bite into. Dried Shrimp with Curry Leaves Crab. In other words, curry crab (without the curry sauce). I took two helpings of this :p I like that the seafood are all so fresh!! Being a seafood lover especially for prawns and crabs, I can tell when the seafood is fresh or otherwise. Boiled Prawns. I would prefer if it was steamed with eggs though. Cos the dip was not as savoury as I thought it would be, it tasted a little bland to me albeit being fresh. Large platter of Oysters :p We thought it was only for the night that we were there, but the PR said that the Oysters are this big EVER SINGLE NIGHT!! So if you love Oysters and nothing else, just come for the Oysters. It's worth it. Bali Hai Seafood Restaurant is pork free but they do serve alcoholic beverages to the customers. They serve plain water and soy milk as beverages but I suggest not to drink too much soy milk or you will easily have a bloated tummy. I think it would definitely be best if they served Rose Syrup or Bandung as well. Til next time, stay beautiful!